Caleb: Knock-knock! Lucy: Who’s there? Caleb’s mother, Lynnette, informed us that this repetition went on approximately twenty-five times. At the twenty-sixth iteration of Caleb’s knock-knock, Lucy stared him in the eye and declared, “No more chances!” With that, she spun on her heel and left Caleb sputtering. Maybe she failed you too many times. Maybe he forgot you too many times. Whatever it is, you feel that a reasonable limit was “offered” and now you have decided to pull the plug. Hear me carefully. I’m not suggesting that if you’re in an emotionally or physically abusive relationship you should continue being a punching bag. I’m talking here about the more routine issues of offense that we all encounter (and cause ourselves). Do we go down the path that Lucy took and declare, “No more chances”? Remember when Peter approached Jesus and said, “Lord, how many times shall I forgive my brother or sister who sins against me? Up to seven times?” He may have been startled at Jesus’ response. “I tell you, not seven times, but seventy-seven times” (Matt. 18:21, 22). Some versions translate the phrase as “seventy times seven.” Clearly, Jesus is driving us to the truth that there is no limit, no statute of limitations on forgiveness. So when it comes to forgiveness, are you generous or stingy? Do you prefer Peter’s limited number of seven “forgivenesses”? Or do you easily migrate toward Jesus’ generous idea of unlimited forgiveness? You never run out of chances with Jesus. He’s asked us to forgive the way He forgives. Do we? Jesus Christ, who is the same yesterday, today, and forever. He who assures us, “I—yes, I alone—will blot out your sins for my own sake and will never think of them again” (see Heb. 13:8; Isa. 43:25 nlt). 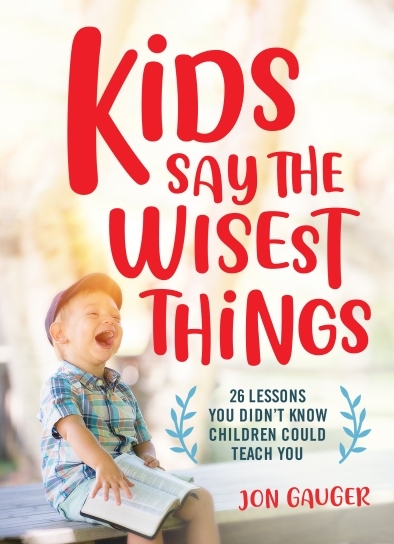 If you enjoyed this story, check out Jon’s new book, Kids Say the Wisest Things. It’s filled with great stories of kids who have something to teach us adults. Preorder now at Amazon, Moody Publishers, CBD, Barnes and Noble, etc.